Winemaker’s Notes: Deep cherry red in color, this wine captivates with its balance, depth, and complexity. The aromas of red fruits delicately intermingle with mineral notes that recall cold ashes and pencil lead. Fine, delicate textures appear on the palate and show this to be an ample, deep wine with a smooth, fine attack followed by an intense, mouth-filling evolution. Concentrated, expressive, and generous in flavors and aromas with a long finish dominated by the balance and elegance of the various layers of flavors. Pair with red meats (beef and lamb) and game in different preparations such as roasts, stews, or braises with red wine, mushrooms, rosemary, and tomatoes. Also pairs very well with assorted terrines and pates, especially duck with truffles, or with aged, dried, or creamy cow’s or goat’s milk cheeses. My Review: This is the fourth year in a row that I’ve gotten to try the Don Melchor Cabernet Sauvignon. With previous vintages (’11, ’13, and ’14), I’ve always gone back and forth on whether I thought it was worth the asking price (I understand the economics, but that’s still a lot to spend on a bottle of wine for me); this is not one of those years. 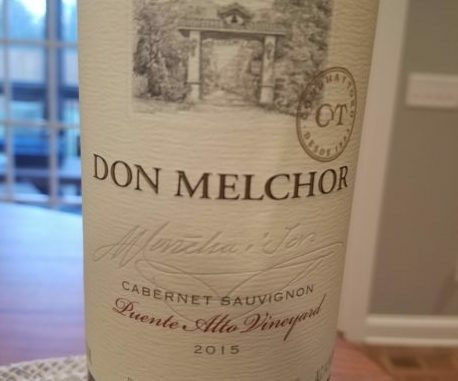 While the Don Melchor Cabernet has never disappointed – it’s always delicious, when they claim that 2015 is the best vintage they’ve ever produced I’m inclined to agree, and this may be the first year where I could be convinced to put down $120 to drink it again. In the glass the wine was a bright ruby red color. On the nose I picked up aromas of pepper and red fruits. In the mouth bright fruit and strawberry started out the party, before giving way to pepper and spice notes and a lingering finish that included hints of smoky meat and bacon that I chalked up to the Petit Verdot (which, for the record, my wife was thrilled to see in the mix; it’s her favorite grape bar none). We paired the wine with some pretty amazing steaks. For Christmas I bought my wife both of Chrissy Teigen’s cookbooks (go buy these books, they’re amazing), and in the first book (Cravings: Recipes For All the Food You Want to Eat) there’s a recipe for John Legend’s steaks in there that includes a marinade that is later turned into a sauce. We marinated a pair of thick New York Strips for 24 hours, and the insanely tender meat paired with the wine was a truly amazing pairing. I know $120 is a lot for most people to spend on a bottle of wine, but if you’re going to splurge on that one bottle, this is one that won’t disappoint. If I see this in my local shop, I know I’m going to have a hard time not splurging.